Public order along with the defence of the realm has always been the raison d’etre of the State throughout history. Maintenance of public order and the rule of law is a key sovereign function of the State, as important in its own way as defending the nation from external aggression or maintaining the unity and integrity of the nation State. The incidence of crime and violence is a reasonably good index of the efficacy or otherwise of the rule of law. The conviction rate in IPC cases which was 64.8% in 1961, has dropped to 42.4% in 2005. Rampant crime accompanied by low conviction rates attest to our failure in enforcing the rule of law and as a result, we have the phenomenon of glorification of vigilantism in our popular culture as testified by the success of the film – Rang de Basanti. Most of all, the mindset of negativism has to go. Police stations should become service centres rather than power centres. They have a role which is multi-dimensional, encompassing responsive policing, preventive policing, proactive policing and developmental policing. Public order is largely a product of efficient general administration, effective policing and a robust criminal justice system. Public order implies a harmonious state of society in which all events conform to the established law and is synonymous with peace,tranquility and the rule of law. There are many causes of public disorder. Widely prevalent crime is a cause as well as an effect of public disorder. In a pluralistic democracy like ours, political polarisation sometimes throws up issues leading to conflicts which escalate into public disorder. Even demonstrations held on legitimate grounds can sometimes degenerate into public disorder.Given our historical inequities on the basis of caste and other social factors, these can easily lead to conflicts that may degenerate into public disorder. Similarly, divisive impulses based on ethnicity, religion, region, language and the sharing of natural resources can exacerbate tensions. With enhanced citizen awareness and assertion, failure in the delivery of services by the State often leads to frustration manifesting itself in public disorder. This tendency is aggravated by increasing criminalisation of politics and persistent interference in the due process of law. With increasing globalisation and the communications revolution, indigenous and transnational criminal organisations have acquired enormous resources and power with the capacity to cause serious breakdown of public order and even undermine the security of India. As opposed to organised crime, which is motivated by the prospect of illegitimate economic gains, terrorist groups are activated by real or imagined ideological motives. They could be homegrown armed groups like Naxalites holding sway in some pockets, or foreign sponsored secessionist groups indulging in reckless violence and mayhem with the sole objective of spreading terror. The greatest danger to public order emanates from the conjunction of foreign sponsored secessionist terrorists with organized crime networks. First, peace and order are necessary preconditions for freedom of expression of individuals and for the resolution of conflicting interests in a democratic society. Second, violence and disorder necessarily undermine economic growth and development, perpetuating a vicious cycle of poverty, frustration and violence. Third, rapid urbanization, which is a necessary concomitant of modernisation, tends to promote impersonal lives and create alienation, thus reducing peer pressure and social control. Fifth, rapid economic growth may sometimes aggravate disparities between individuals, groups and regions leading to escalation of tension and breaches of peace. Sixth,weak enforcement and failure of the criminal justice system create a culture of lawlessness posing a major threat to public order. Finally, organised crime, militancy and terrorism have devastating consequences on the morale of the public; such a situation may even lead to the unnecessary loss of life as well as serious economic and political dislocation in an interdependent economy and polity. Among State agencies, police, by the very nature of their role, are the most visible arm of the government. The power of the State is expressed in its capacity to use force. As police are the agency to enforce the will of the State, the capacity of the police agencies to respond to a potential or real challenge to public order – rapidly, efficiently and justly – is of paramount importance. It is equally important to ensure that this power is exercised in a democratic society within the bounds of the Constitution and the law. Ultimately, the manner in which the police functions is an index of society’s respect for civil liberty and the rule of law. However just and efficient policing may be, security agencies alone cannot enforce the rule of law and maintain public order. An effective and impartial criminal justice system is a necessary precondition for order and harmony in society. Therefore, the preventive provisions for maintaining peace and order and matters relating to crime investigation, prosecution and trial need to be examined in detail. A democratic society is necessarily characterised by public expression of dissent.Such dissent arises from a variety of socio-economic, political and cultural factors. In India,the situation is further compounded by factors such as caste, religion, poverty, illiteracy,demographic pressures, ethnic and linguistic diversity. The country has witnessed many disturbances – agrarian unrest, labour and student agitations, communal riots and caste related violence – which sometimes escalate into major disorders, especially when partisan politics come into play and where the administration fails to act early in resolving conflicts.Indeed, lack of good governance and poor implementation of laws are the major factors for public disorder. – maintenance of public order is universally recognised as the prime function of the State.Anarchy would result if the State failed to discharge this duty. Such persistent anarchy would lead to decay and destruction and the eventual disintegration of the State. It is quite vital to understand what takes primacy on what grounds and the necessary distinction between National Secuity, Public order and Law and order. More often one is interpreted as other and it not necessarily wrong, however the agency that enforce rule of law must be able to delineate one form other, so as to understand the situation better and application of force proportionately. 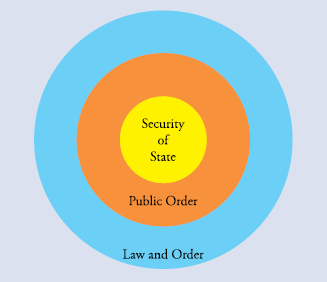 Thus every situation in which the security of the State is threatened is a public order problem. Similarly, all situations which lead to public disorder, are necessarily law and order problems also. But all law and order problems are not public order problems. Thus, petty clashes between groups whose impact is limited to a small area are minor in nature with no impact on public order. But widespread violent clashes between two or more groups,such as communal riots, would pose grave threats to public order. A major terrorist activity could be classified as a public order problem impinging on the security of the State. Restraint of State while exercising force:-While every violation of law should be seen as a challenge to public order, the State should not precipitate a crisis by treating every infraction as a public order crisis. Superstitions and cultural attitudes, for example, take time, patience and education to change. India is an over-legislated country. The temptation to short circuit the process of modernisation by law and use of force should be resisted except when local opinion and prevailing societal norms are grossly violative of the core principles of the Constitution and democratic governance. In the post-Independence era, India has faced several instances of large scale public disorder, starting with the communal conflagration during Partition. Even now communal riots pose a grave threat to peace and order. The 1950s witnessed violent linguistic riots in some parts of the country. There have been violent secessionist movements in the North-East, Punjab and Jammu and Kashmir. There are numerous instances of agrarian, labour and student unrest. The last decade has seen an upsurge of violence by the left wing extremists,who have extended their influence over large tribal areas. Urbanisation has brought to the fore the shortcomings in the delivery of basic services, which at times, results in violent agitations. With improving awareness levels, conflicts over sharing of resources are increasing in rural and tribal areas. Organised groups, especially those concerned with the supply of essential services, have, on occasion, caused major public disorder by resorting to agitation,obstruction and violence. Communalism in a broad sense implies blind allegiance to one’s own communal group – religious, linguistic or ethnic – rather than to the larger society or to the nation as a whole. In its extreme form, communalism manifests itself in hatred towards groups perceived as hostile,ultimately leading to violent attacks on other communities. Communalisim is a way of thinking -the result of perversions of religions and distortions of history.Today Communalism is made more bitter by a mixture of regionalism and parochialism. The border State of Jammu and Kashmir and some parts of the North East have witnessed prolonged terrorist activities. Several acts of terror in recent years – hijacking of an aircraft(1999), attacks on the Parliament in New Delhi (2001), on Akshardham Temple in Gujarat(2002), and at the Indian Institute of Science, Bangalore (2005), bomb blasts in market places in Delhi (2005) and in Varanasi (2006), serial bomb blasts in Mumbai (2006) andMalegaon (2006), massacre of labourers in Upper Assam (2007) etc. – all demonstrate that terrorism is not confined to a few pockets and that almost every part of the country is vulnerable. Even when the proximate cause of action or the political objective of the terror group is limited to a part of the country, the existence of sleeper cells, the spread of modern communications, an integrated economy and the increasing use of terror technology and tactics, have made it easy for the merchants of terror to spread their tentacles all over the country. As a result, terrorism is not merely a public order problem but has emerged as a grave threat to national security as well. An analysis of some of the recent terrorist attacks indicates that terrorist organisations have used the existing organised crime networks. Terrorist groups and these crime syndicates have international links with similar organisations and are supported by foreign agencies inimical to our interests. Their activities are being financed through international money laundering and drug trafficking thus creating an intricate web of crime, terror and trafficking in arms and drugs. The North East region has more than 200 ethnically diverse groups with distinct languages, dialects and socio-cultural identities. Some parts of this region have been suffering from militancy for several decades. Militancy in the region started with the Naga movement way back in the early 1950s and rose to serious levels in Manipur in the 1960s. Large scale immigration into Tripura gave birth to militancy there in the 1960s. Militancy in Assam,on the ‘foreigners issue’, has multiplied and spread to many new areas. Statehood while others demand greater autonomy within the existing State. Extortion and abduction are frequently resorted to by some of the militant groups. United Liberation Front of Assam (ULFA) and National Democratic Front of Bodoland (NDFB); Manipur – People’s Liberation Army (PLA), United Liberation Liberation Front (UNLF), People’s Revolutionary Party of Kangleipak (PREPAK), Kangleipak Communist Party, Kanglei Yaol Kanba Lup (KYKL), Manipur People’s Liberation Front(MPLF) and Revolutionary People’s Front (RPF); Meghalaya – Achik National Volunteer Council (ANVC) and Hynniewtrep National Liberation Council (HNLC ); Tripura – All Tripura Tiger Force (ATTF) and National Liberation Front of Tripura (NLFT); Nagaland- Nationalist Socialist Council of Nagaland (Isak Muivah)-[NSCN(IM)] and Nationalist Socialist Council of Nagaland (Khaplang)-[NSCN(K)]. indulging in violence, Naxalites continue to hold Jan-Adalats, a mechanism to dispense crude and instant justice. Naxalism has become an issue of major concern. Naxalites operate in the vacuum created by the inadequacy and ineffectiveness of the administrative machinery. It is a fact that the tribal hinterland of the country has emerged as the bastion of the Naxalite movement.The problems of poverty and alienation, the demand of territorial rights and displacement from traditional forest habitats have aggravated the problem. Besides, unequal sharing of benefits of exploitation of resources has also helped create a fertile breeding ground for the growth of this menace. The classical school in criminology propounded the theory that every human being acts on a rational basis and would try to maximise his gains or minimise his pains. This was the basis of the theory of deterrence. As per this theory the State tries to prevent crimes by institutionalising a system of law enforcement, which would give adequate punishment to the offender to act as a deterrent. The neo-classical school supports the classical viewpoint but places emphasis on reform and rehabilitation of the offender. There have been several other theories of criminology which have added social, psychological and economic dimensions to the causes of crime. As postulated by modern theorists, controlling crime requires a multi-pronged approach involving socio-economic and psychological measures;this does not, however, invalidate the theory of deterrence. Hence the importance of a comprehensive and efficient system of criminal justice administration. side by side has been the matter of strength in our multi-cultural system but fringe elements often create unrest. Economic: Underdevelopment is arguably a cause of tension. The desire to improve one’s position in competition with others, itself creates stress and in India, with 250 million people below the poverty line, the strain is significant. Administrative: The administrative machinery is not always perceived by people to be objective and fair. Slackness in delivery of services, lethargy in enforcement of laws is at times a major reason for frustration in citizens. Corrupt and self seeking behavior of some officials compounds the problem further. One of the major causative factors for the eruption of public disorder is the inadequacy of the administration in enforcing the legitimate constitutional, statutory and traditional rights of citizens leading to serious discontentment among them. Political: In a vibrant democratic system, not a totalitarian regime, divergent political view points can lead to tension. More important, however, is the problem of political expediency where a section of the political leadership tries to use the administration for furthering its own political agenda. The increasing propensity to use public office for private gain, unwarranted interference in crime investigation and day to day functioning of police, short-term populism at the cost of durable solutions, complexities of a federal polity – all these make it difficult to address some of the growing threats to public order. Added to this is the relatively low importance attached to public order in our political discourse.All these contribute to breakdown of the public order fabric. P.S. – This article enlists the issues related to public order, their various manifestations, concepts and problems.Next article will follow in detail analysis of weaknesses of the state’s apparatus to contain the public order.